I love ice cream so much that I can finish the whole tub of ice cream within minutes. This always left me with a sinful guilt regretting the amount of sugar and calories I have consumed. Now, I can enjoy my ice cream craving guilt free and sugar free thanks to Sugalight Factory's ice creams. Sugalight's ice creams are conceived through intensive in-house research and development that are produced without dairy cream, sugar and egg yolks. Sugalight's ice creams are made with with Xylitol, a premium natural sweetener found in corn. 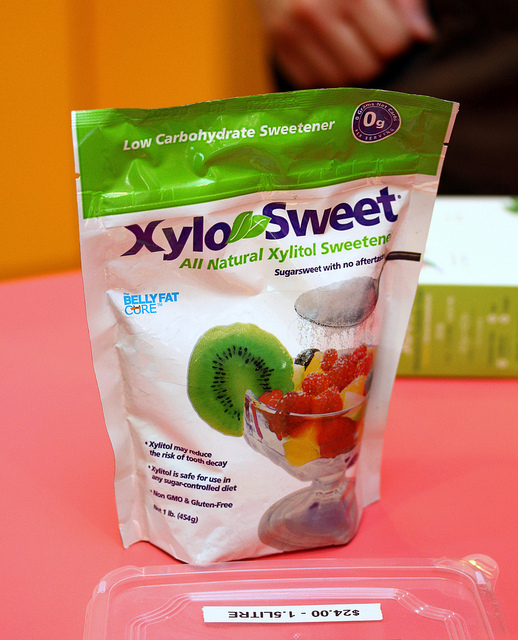 Xylitol is lower in calories than sugar, prevents tooth decay and does not cause dangerous spikes in blood sugar levels. Sugalight's ice creams are great for diabetics and health conscious people keen to manage their sugar intake. Sugalight Factory is located at Joo Chiat Place. It is currently a take away shop but has plans to expand its business. The three month's old shop has innovatively formulated 20 over delicious low fat and sugar free ice creams flavours that taste like premium high-fat ice creams. They have many flavours such as Cappuccino, Plain Valrhona Chocolate, Strawberry Bliss, Creamy Durian, Matcha Green Tea, Fat-free Mango Sorbet, Vanilla Macadamia, Jamaican Rum and Raisin, Baileys Irish Cream etc. The Ube Purple Yam ice cream excited me the most. The beautiful purple colour came from Ube which is a purple yam from Philippines. I was introduced to Ube (Purple Yam) ice cream many years back when my Filipino colleague brought it back from Philippines. I finally got to taste it again without flying to Philippines. The Durian Ice Cream at Sugalight Factory used a mix of D24 and Mao Shan Wang durians. It is one of their best sellers. I found it surprisingly better in flavour than some of the premium ice cream shops. Whoever came out with the idea to turn my favourite Pulut Hitam dessert into an ice cream is a genius. Now I have the excuse to enjoy my dessert anytime of the day with Sugalight's Pulut Hitam low calories and sugar free ice cream. Every scoop of the fruity Crumbly Strawberry Ice Cream came with bits of the natural fresh strawberries delighted the palate with its natural fruity flavours. The Italian Hazelnut Ice Cream although looked light in appearance, it had a strong lingering nutty flavours. For tea and alcohol lovers, there are Japanese Green Tea and Rum & Raisin ice cream flavours too. Sugalight's ice creams althought are less sweet and creamy compare to other premium high-fat ice creams, they have a stronger natural ingredient flavours. Sugalight Factory delivers their ice creams tubs (473ml) right to your doorstep. For purchases above $50, delivery will be free. Otherwise, there will be an additional charge of $15. Only cash will be accepted. Please call them 3 days in advance to order. 1) Alight at Paya Lebar MRT station. Head south towards Geylang Serai Malay Village. Cross Geylang/Changi Road and continue onto Joo Chiat Road. Turn left into Joo Chiat Place. Journey time about17mins. man, i miss the durian ice cream! Wowow so many hard to choose leh. But i am interested in the Yam, Pulut Hitam and Rum & Raisin Ice Cream. @Cuisine Paradise next time we can go and try.